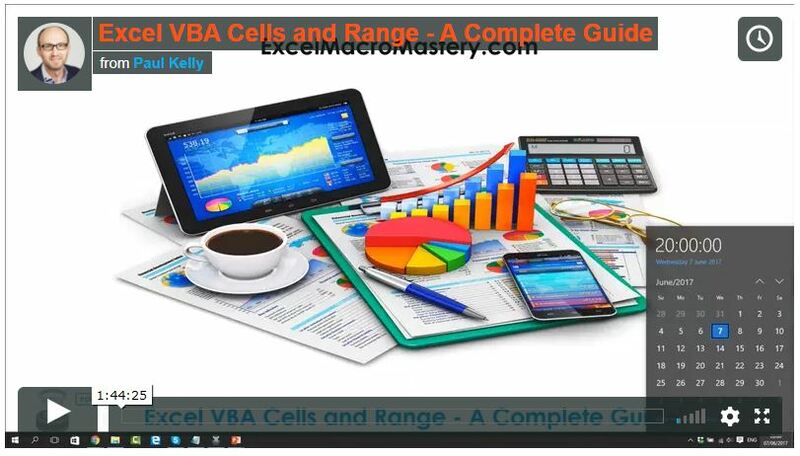 This post covers everything you need to know about using Cells and Ranges in VBA. You can read it from start to finish as it is laid out in a logical order. If you prefer you can use the table of contents below to go to a section of your choice. 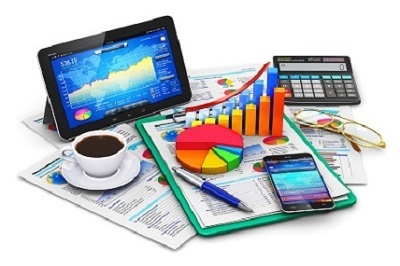 Topics covered include Offset property, reading values between cells, reading values to arrays and formatting cells. If you are a member of the VBA Vault, then click on the image below to access the webinar and the associated source code. This is the third post dealing with the three main elements of VBA. These three elements are the Workbooks, Worksheets and Ranges/Cells. Cells are by far the most important part of Excel. Almost everything you do in Excel starts and ends with Cells. Change the format of a cell. In this post I will tackle each one, explain why you need it and when you should use it. Let’s start with the simplest method of accessing cells – using the Range property of the worksheet. I have recently updated this article so that is uses Value2. Using Value may truncate number if the cell is formatted as currency. If you don’t use any property then the default is Value. 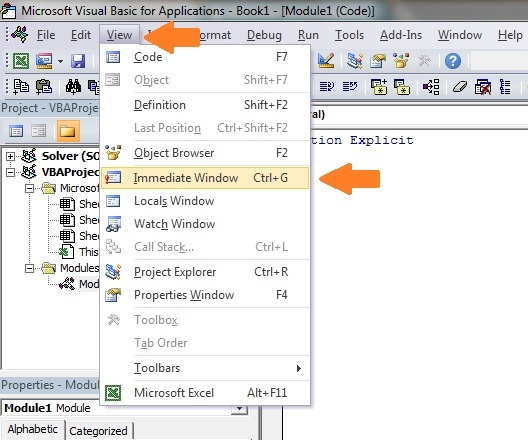 The worksheet has a Range property which you can use to access cells in VBA. The Range property takes the same argument that most Excel Worksheet functions take e.g. “A1”, “A3:C6” etc. The following example shows you how to place a value in a cell using the Range property. As you can see Range is a member of the worksheet which in turn is a member of the Workbook. This follows the same hierarchy as in Excel so should be easy to understand. To do something with Range you must first specify the workbook and worksheet it belongs to. For the rest of this post I will use the code name to reference the worksheet. 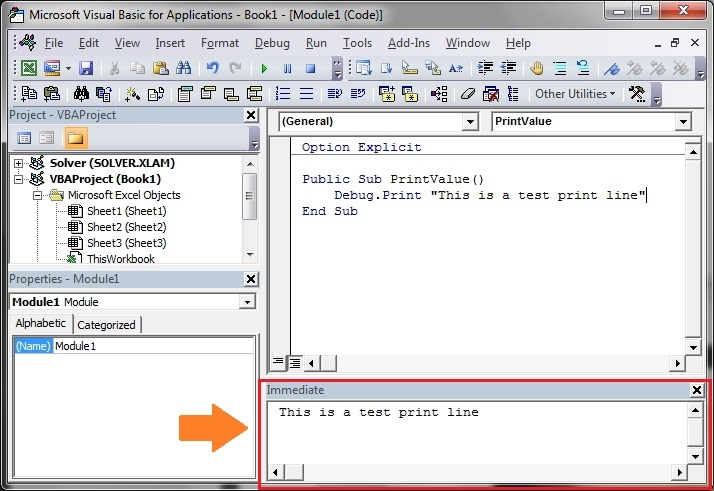 The following code shows the above example using the code name of the worksheet i.e. Sheet1 instead of ThisWorkbook.Worksheets(“Sheet1”). Cells returns a range of one cell only. Cells takes row and column as arguments. You may be wondering when you should use Cells and when you should use Range. Using Range is useful for accessing the same cells each time the Macro runs. For example, if you were using a Macro to calculate a total and write it to cell A10 every time then Range would be suitable for this task. Using the Cells property is useful if you are accessing a cell based on a number that may vary. It is easier explain this with an example. In the following code, we ask the user to specify the column number. Using Cells gives us the flexibility to use a variable number for the column. Sheet1.Cells(1, UserCol).Value2 = "John Smith"
In the above example, we are using a number for the column rather than a letter. To use Range here would require us to convert these values to the letter/number cell reference e.g. “C1”. Using the Cells property allows us to provide a row and a column number to access a cell. Sometimes you may want to return more than one cell using row and column numbers. The next section shows you how to do this. As you can see, you provide the start and end cell of the Range. Sometimes it can be tricky to see which range you are dealing with when the value are all numbers. Range has a property called Address which displays the letter/ number cell reference of any range. This can come in very handy when you are debugging or writing code for the first time. In the following example we print out the address of the ranges we are using. Range has a property called Offset. The term Offset refers to a count from the original position. It is used a lot in certain areas of programming. With the Offset property you can get a Range of cells the same size and a certain distance from the current range. The reason this is useful is that sometimes you may want to select a Range based on a certain condition. For example in the screenshot below there is a column for each day of the week. Given the day number(i.e. Monday=1, Tuesday=2 etc.) we need to write the value to the correct column. We will first attempt to do this without using Offset. As you can see this solution is much better. If the number of days in increased then we do not need to add any more code. For Offset to be useful there needs to be some kind of relationship between the positions of the cells. If the Day columns in the above example were random then we could not use Offset. We would have to use the first solution. Sheet1.Range("B2").Offset(, 1).Value2 = "Cell C2"
Sheet1.Range("B2").Offset(1, 1).Value2 = "Cell C3"
Sheet1.Range("B2").Offset(-1, -1).Value2 = "Cell A1"
Sheet1.Range("D2:F12").Offset(1, 1).Value2 = "Cells E3:G13"
CurrentRegion returns a range of all the adjacent cells to the given range. In the screenshot below you can see the two current regions. I have added borders to make the current regions clear. A row or column of blank cells signifies the end of a current region. You can manually check the CurrentRegion in Excel by selecting a range and pressing Ctrl + Shift + *. If we take any range of cells within the border and apply CurrentRegion, we will get back the range of cells in the entire area. You can also use Cells, Rows and Columns as part of a Range rather than part of a Worksheet. You may have a specific need to do this but otherwise I would avoid the practice. It makes the code more complex. Simple code is your friend. It reduces the possibility of errors. In most of the examples so far we have written values to a cell. We do this by placing the range on the left of the equals sign and the value to place in the cell on the right. To write data from one cell to another we do the same. The destination range goes on the left and the source range goes on the right. The Copy function copies everything including the format of the cells. It is the same result as manually copying and pasting a selection. You can see more about it in the Copying and Pasting Cells section. When copying from one range to another using assignment(i.e. the equals sign), the destination range must be the same size as the source range. Using the Resize function allows us to resize a range to a given number of rows and columns. When we want to resize our destination range we can simply use the source range size. We looked at how to read from one cell to another. You can also read from a cell to a variable. A variable is used to store values while a Macro is running. You normally do this when you want to manipulate the data before writing it somewhere. The following is a simple example using a variable. As you can see the value of the item to the right of the equals is written to the item to the left of the equals. To read text to a variable you use a variable of type String. You can write a variable to a range of cells. You just specify the range on the left and the value will be written to all cells in the range. You cannot read from multiple cells to a variable. However you can read to an array which is a collection of variables. We will look at doing this in the next section. If you want to copy and paste a range of cells then you do not need to select them. This is a common error made by new VBA users. Using this method copies everything – values, formats, formulas and so on. If you want to copy individual items you can use the PasteSpecial property of range. You can also copy values by assigning the value of one range to another. The value of range in this example is considered to be a variant array. What this means is that you can easily read from a range of cells to an array. You can also write from an array to a range of cells. If you are not familiar with arrays you can check them out in this post. The following code shows an example of using an array with a range. Sometimes you may want to go through each cell one at a time to check value. Debug.Print rg.Address + " is negative." You can also go through consecutive Cells using the Cells property and a standard For loop. The standard loop is more flexible about the order you use but it is slower than a For Each loop. Debug.Print Range("A" & i).Address + " is negative." You can read from a range of cells to another range of cells. You can read values from cells to variables and vice versa. You can use a For Each or For loop to run through every cell in a range. Free VBA Tutorial If you are new to VBA or you want to sharpen your existing VBA skills then why not try out the The Ultimate VBA Tutorial. Related Training: Get full access to the Excel VBA training webinars and all the tutorials. Even after 20+ years of working with Excel & VBA, and teaching others the “basics and more” on a regular basis, once I stumbled onto your site I’ve found myself returning often to reference (or recommend) your “complete guides” (mainly Collections & Dictionaries). Comprehensive but easy to understand. Again – great site, thanks. I have enjoyed your informative review. You explain things well. This is the code that I’ve written. The idea is to get the user to fill in cells E to U if cell D is filled, before they can save the file. My issue is that I can’t seem to get the code to work if I put in the range like above. It does work however if I just put in one cell e.g If Sheets(“Savings (2)”).Range(“D6”).Value “” And Sheets(“Savings (2)”).Range(“E6”).Value. Can you tell me what is the issue? I replied to your other comment asking the same question. Multiple cells in a range is equivalent to a 2D array. You cannot compare an array to a single value. You need to read through the array and check each value. I read this hoping to find how to do something specific and did not find it. I am writing a macro with a list of ranges as arguments (R0, R1, R2) . All but the first are optional. I have an array in the macro which is of type range (Dim Rx(2) as range) and want to copy the three optional arguments into the array so that I can process them in a loop. When I tried R(0) = R0 it failed. You need to use Set when assigning one range to another. The following code works in VBA directly, returning the contents of the first cell in the current region. 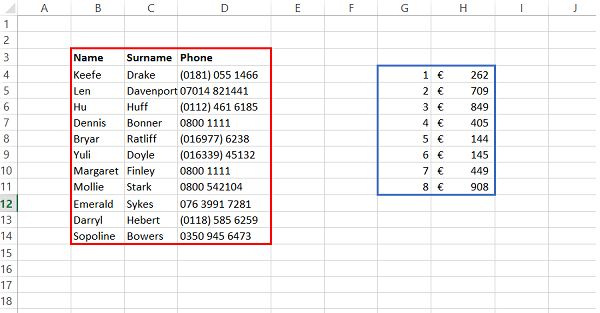 But if I call it from Excel by entering ‘=testf(C102)’ into a cell it only returns that cell, not the current region. I have tried it with both byref and byval with the same result. How can the same code return two different results depending on whether it is called from VBA or from Excel? It’s an issue with CurrentRegion in User Defined Functions. If you google it you will see some discussions about it. Unfortunately you will need to create a workaround. Thank you for this great work! Your blog helped me a lot to start my work in VBA. I want to run a sub, which gets data and sets a title, containing a value from a cell which is contains a value from a view from SQL-Server. This must be refreshed first. Paul, is there some way, besides retrieving and comparing every cell in every row and column on an entire sheet, to find whether a certain string exists anywhere in the sheet? That is, is there something like a “populated range” variable (or “max populated row#” x “max populated column#”) that I could use to limit the range I need to check when doing a string search in a sheet? Without this, there are > 1M rows by 16384 columns that would all need to be searched cell-by-cell. I don’t recall ever seeing reference to something like this, but it’s hard to believe that the built-in Excel Search function actually does it the brute-force way. I could probably search the binary file for the string instead if I only wanted to know if it existed (and the string were unique enough), but then I wouldn’t be able to return a cell location reference. You can use UsedRange to get all the cellshttps://excelmacromastery.com/wp-admin/edit-comments.php#comments-form used on a given worksheet.